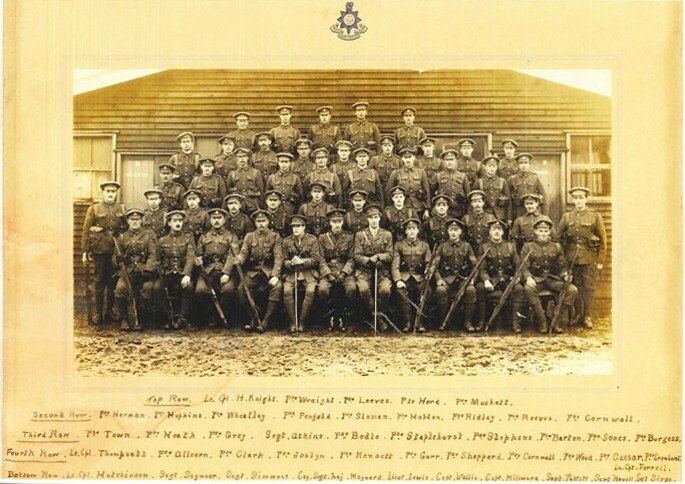 A memoir of a soldier serving with the Royal Sussex Regiment in France during WWI was found at the West Sussex Record Office archive recently. This is the diary of Raplh Ellis an Arundel man who was also an accomplished artist. In five manuscript volumes and an edited typed text, entitled ‘A March with the Infantry’, the memoirs of Ralph Ellis are a powerful and compelling record of the life of a soldier serving in the Royal Sussex Regiment on the Western Front in the Great War. Ellis, an artist and inn-sign painter, lived in my home town of Arundel, which sparked my initial interest. I focused on the memoir for my Masters dissertation, placing it within the context of such well-known memoirs as those of Siegfried Sassoon and Robert Graves. On further study of Ellis’ memoir I discovered an account of the Great War rich with keen observation and vivid description. The memoir begins with a series of sketches of Ellis’ comrades and of his surroundings in France and later he adds watercolours of the views from his observation post across no man’s land. However, as the conflict develops, his artistic talents no longer seem adequate to portray the full horror of his experiences and he increasingly employs graphic prose to describe what he sees, hears, and smells. This is a very personal account that resonates with the experiences of others, but lacks any of the disillusionment and bitterness for which they are known. A century later Ellis’ memoir enhances our understanding of what it was like to fight in the trenches and is valuable evidence of the experience of war.